One of our best selling office chairs. This chair features contemporary styling in rich black leather plus with a softer feel than the typical cow hide leather. The lumbar cushion supports your lower back for less stress while sitting. Also features fingertip pneumatic seat height control which instantly raises and lowers your seat from 17" to 21" from the floor and tilt tension adjustment which controls rocking motion -a little or a lot. Upgrade to an optional chrome base for a minimal charge. Dimensions: Seat size: 20"W x 20"D x 3"Thick. Back size: 20"W x 25"H x 3"Thick. Fully warranted by Boss Office Products. 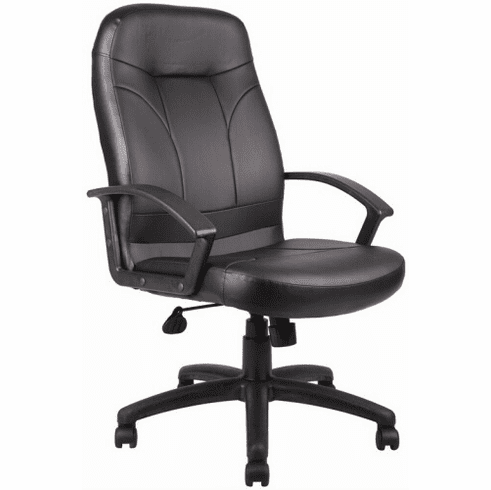 This leather office chair normally ships within 2-3 business days from our GA or CA warehouse.